This DVD is intended to give riders a different kind of appreciation and improved understanding of dressage: dressage is there for the horse and not the horse for dressage! With her experienced trainer and advisor Manuel Jorge de Oliveira, the classical dressage trainer Anja Beran shows how correct dressage makes a horse into a really good riding horse. Well-muscled and physically as well as mentally well-balanced, it becomes a self-confident and contented partner for the whole of its life which – thanks to classical horsemanship – can be long and healthy. 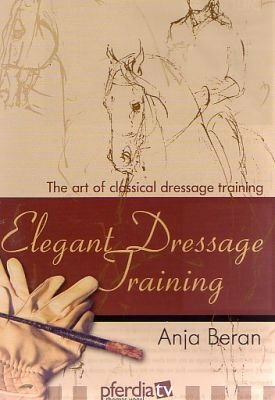 Anja Beran starts off with assessing the weaknesses and asymmetries of the horse and then, by means of specific exercises to improve its physical state, shows everything which dressage can do for the horse in order to achieve grace, aesthetics, harmony and lightness. Flamingo is a Westphalian stallion with a special history. Anja Ilona Beran received training in classical equestrianism with Manuel Jorge de Oliveira, a pupil of the very famous Nuno Oliveira. She trains horses of different breeds from three-year olds to haute école. For her the centuries-old classical equestrian art is the “primal source of all equestrian knowledge and ONLY this is the basis for EVERY other form of good riding”.